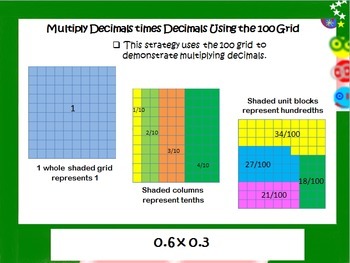 Looking for a quick and easy method to visually connect your students to the strategy of multiplying decimals by decimals? 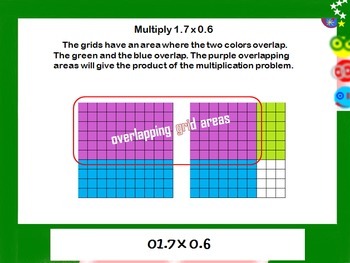 This PowerPoint models step-by-step multiplying decimals using the 100 grid area model. 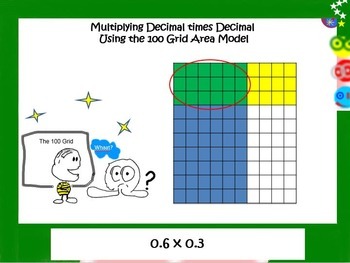 Two examples are demonstrated, 'a decimal times a decimal' and 'a whole number and decimal times a decimal'. Students follow along completing each step on a worksheet provided in the PowerPoint to be duplicated and distributed. The worksheet also has a 'Your Turn' problem for students to complete after the PowerPoint while the process is fresh in their memory. Students will enjoyed this activity as they will be engaged in each step using colored pencils to complete the examples as they follow along. 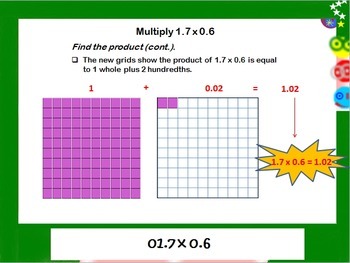 Student involvement aids comprehension in this multiplying-decimals-made-easy PowerPoint. Get this PPT in a bundle and save!!! Visit my store, http://www.teacherspayteachers.com/Store/Joi9000, for more common core product. Many are still in the making, so check back often.